The best operating automotive dealership groups realize that a level of dealership autonomy in sales and service commission plans is a necessity to maximize performance and effectiveness; regional, brand, and individual dealership idiosyncrasies are best addressed by allowing variances within commission plans. These groups most effectively realize this autonomy by coupling it with structure in process and plans, and absolute rigidity around certain items such as plan acceptance. 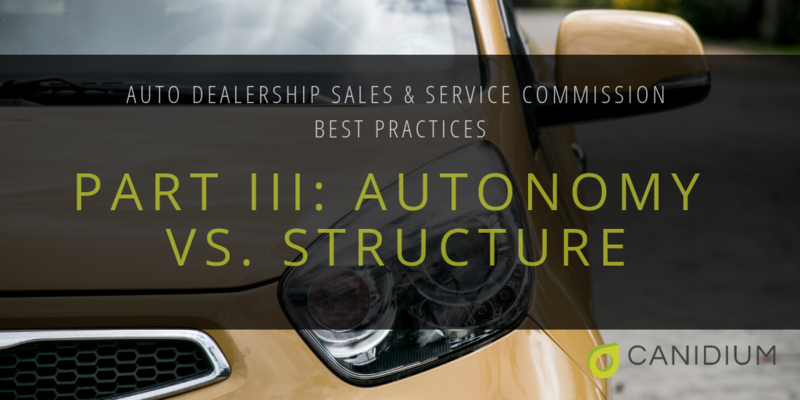 Dealership groups can allow for variances within commission plans by offering an array of standard commission components, rate, and guarantee/draw options from which dealerships can choose when constructing their plans. Processing rules and terms and conditions to be included in plans necessarily vary by region (e.g. California) but their inclusion and acceptance is mandatory. The well run dealership group knows that structure and controls is a necessity with these items despite allowing flexibility with other commission plan aspects. To receive future pieces in this series, opt-in below! See Part II here.